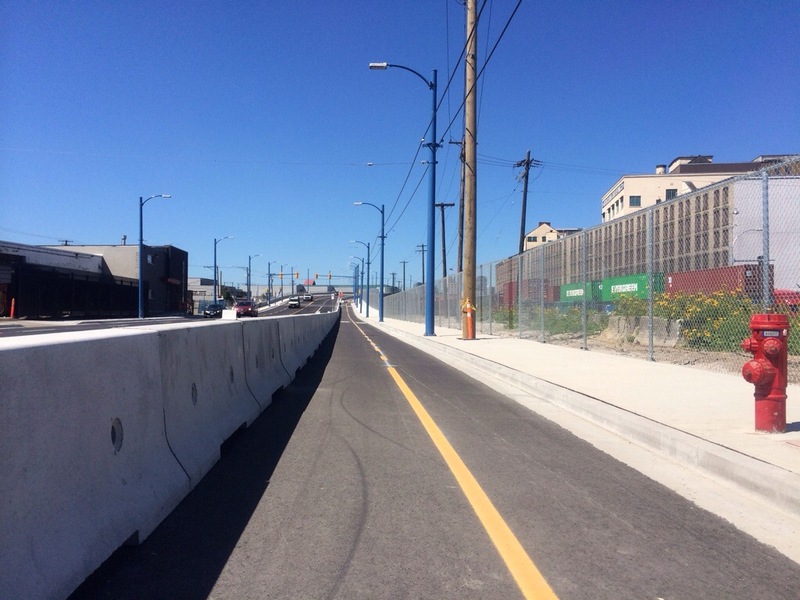 Earlier today, I took the chance to ride the just-opened Powell Street overpass in Vancouver. It has a separated bike lane, on the north side of the overpass. It stretches from Hawks Avenue at the western end to Clark Drive at the eastern end. It’s only been open a few days, so I wasn’t sure how to approach it, as I was heading east from Downtown along Cordova Street. Hopefully signage will be coming up to let cyclists know how to access this heading east. It’s a little incongruous that this bike lane just ends abruptly at Clark, without any decent connection to the rest of the bike network, although the start of the Mosaic route is two blocks away. (According to Richard Campbell, this connection is part of the city’s transport plan.) At least the city’s cycling options are growing!